We were here for a wedding dinner food tasting and I must say their quality of food way exceeded our expectations and even surpass those of many 5 stars hotel! If you’re looking for an exclusive wedding banquet venue, do consider Raffles Town Club, not only for their food choices, but overall ambience and package too Cold Dish Combination (Crabmeat Omelette, Smoked Duck, Roasted Char Siew, Crispy Enoki Mushroom with Octopus, Deep-Fried Silver Fish)A generally well prepared cold dish that was tasty. 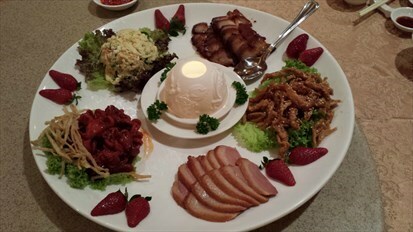 I especially love their Smoked Duck and Roasted Char Siew as they were really soft and fragrant. 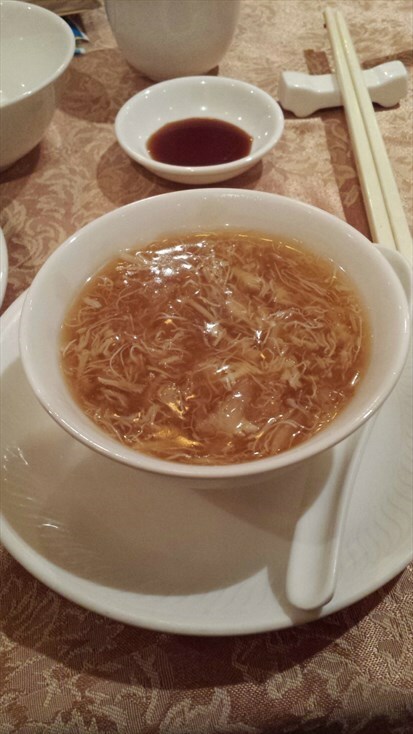 Braised Shark's Fin Soup with Bamboo Pith and CrabmeatA hearty bowl of shark’s fin soup that was not too starchy and filled with generous amounts and shredded crabmeat and shark’s fin. The taste was also very fresh and rich. Wok-Fried Scallops and Prawns with Broccoli, "Shimeiji" Mushrooms and XO SauceOne of my favourite dishes among the 8-course dinner set. 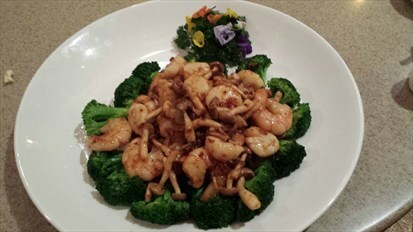 The XO sauce was mildly spicy with a hint of buttery fragrance and sweetness of seafood. The prawns and scallops were fresh and crunchy. Steamed Coral Trout with TurnipsThe fish was very fresh but unfortunately, overcooked. The meat was kind of dry though the flavours were well locked in. Braised Abalone Mushrooms with Sea Cucumber and SpinachThe sea cucumbers were really delicious and literally melted in our mouths! The QQ texture was a pleasure to savour. 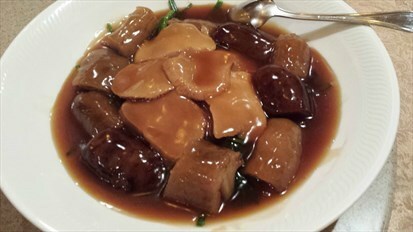 This was a tastefully prepared dish with well braised abalone mushrooms and sea cucumber that were simply delectable. Roasted Chicken with "Mala" SauceThe roasted chicken was tender, juicy and soft. 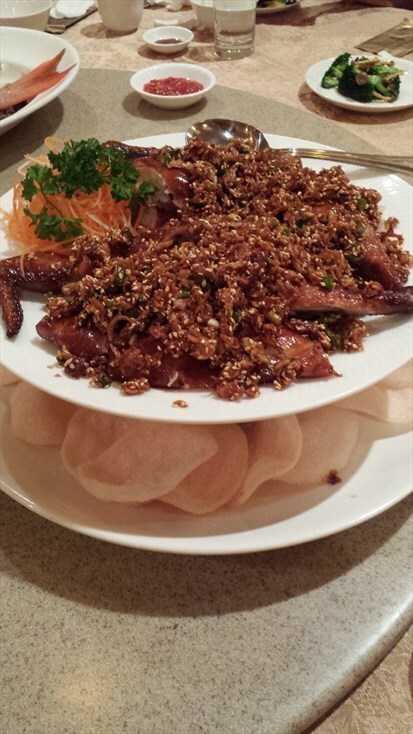 Topped with a generous amount of fried shallots, the aroma of this dish easily captured our hearts and taste buds. 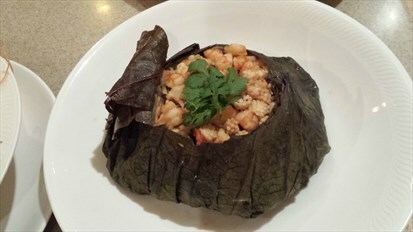 The kids especially love the prawn crackers that accompanied this dish. Braised "Ee Fu Noodles" with Diced Seafood, Mushrooms and Yellow Chives wrapped in Lotus LeafThe Ee Fu Noodles unfortunately missed the mark. The presentation was unique (we usually associate lotus leaf with rice), but the noodles were blend and did not exude any tinge of fragrance. Thankfully, the chili sauce was good and added the much needed kick to spice up this dish. 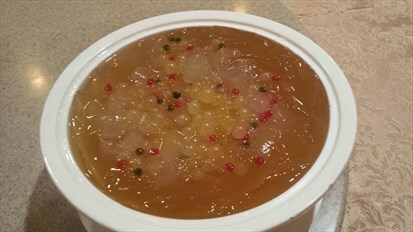 Lemongrass Jelly with Aloe VeraA perfect ending to wrap up this lovely food tasting session. Not a common dessert that’s being served during wedding banquet, this was a refreshing twist that was enjoyed by both the old and young. 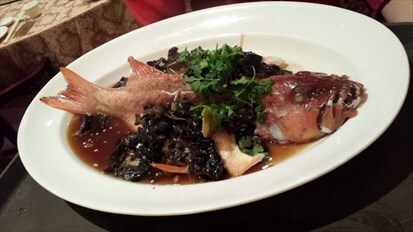 The zesty flavour, coupled with chewy tadpole toppings, were an interesting combination that was a delight to savour.